canoe – Damn Life is Good! So one of my fondest memories when I was an almost-teen was a two week long canoeing and camping trip wth my Mom, Dad and poodle Nikki in Quetico Provincial Park in the Canadian Boundary Waters. I still remember oodles of stories from that tip, but those are for another time. I do remember taking along Popiel’s Pocket Fisherman and fishing with freeze-dried peas as bait. But for me, it was canoeing that was the real joy of the trip. The sound of the canoe sliding through the water. The tug of the oar. The water droplets dripping off the end of the oar into the still water. Last fall, just before the weather turned, Susan and I got to spend a few days with our dear friends Terri and Tor at their cabin on Lake Vermillion in northern Minnesota. And they had an old Grumman aluminum canoe just like we had – probably just as old. Susan and I took it out on the lake and had a ball, and all of those old sensory memories came flooding back. What fun! So we decided then and there to get ourselves a canoe. We live in a place surrounded by hundred of lakes – many as quiet and peaceful as the boundary waters, but just down the road from us. What could be more fun that paddling around a quiet lake together, bottle of wine in the canoe with some apples and Swiss cheese? I can’t wait! So I did my research – found the best “starter” canoe for us. Found the best price (it IS cheaper buying a canoe in the winter – guess places want to move their inventory! ), and ordered it online. So we got notice it was shipped – coming to us with Old Dominion as the shipper – in the middle of late winter. I arranged the drop off – being winter, the semi couldn’t make it down our 900 foot driveway – so I was going to meet him on Highway 16, right at the end of the drive. But when the driver got there, he got spooked – he didn’t even want to take the semi on Highway 16. I told him logging trucks motor down the road all day long in the winter. He wasn’t buying it. So he dropped the canoe right on the side of Highway 2 (our main highway up here) in the snow. 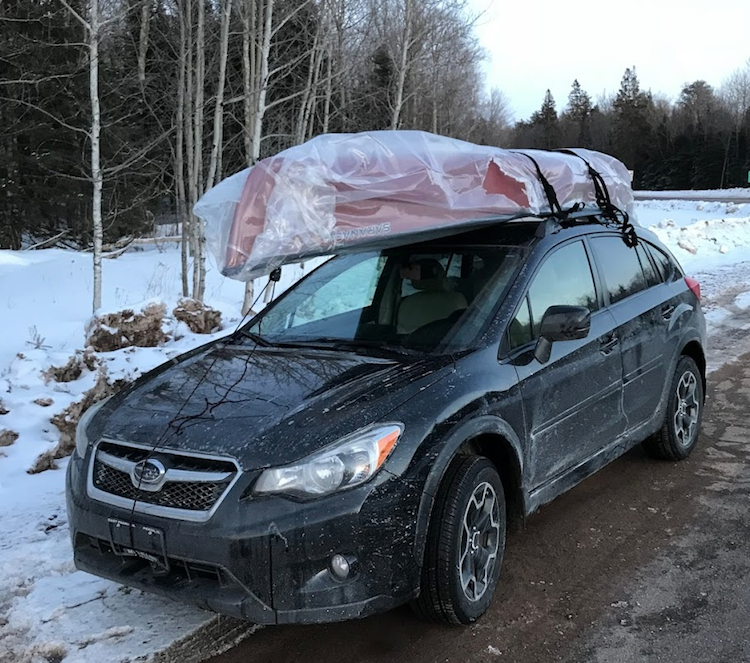 So there I was, alone in the 9 degree weather (I checked the temperature) with my Subaru and a 15 foot canoe wrapped in white plastic. What to do? I left the boat on the side of the road and drove to our garage and got our canoe tie-downs and a pocket knife. I got back to the boat and cut off the first layer of plastic (sort of like a giant white canoe condom!) 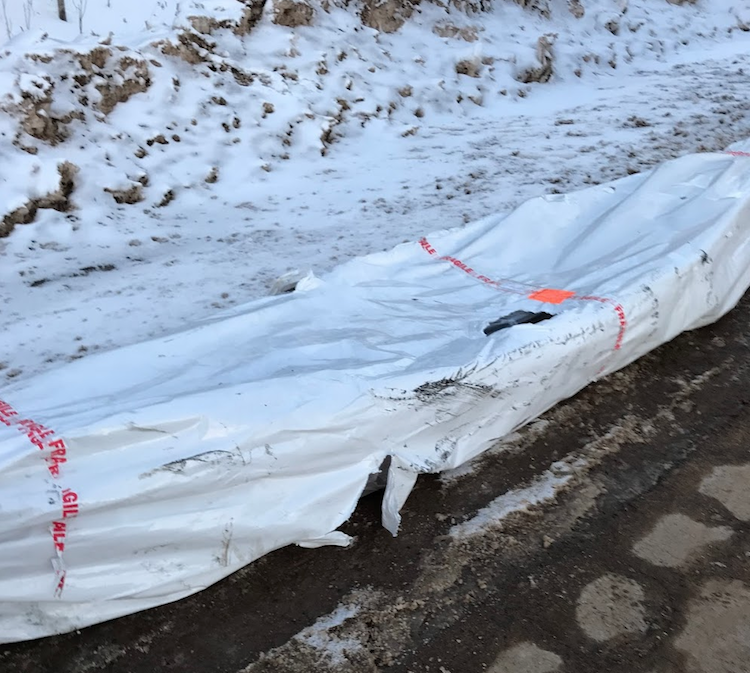 and then tried to figure how to get that bad boy on top of the car and secured – still wrapped in a second layer of plastic and my fingers chilled to the bone. As I was fiddling around, a late model F150 stopped across the road – the driver regarding me from a distance. After about five minutes, he drove across highway 2 and pulled up behind me and got out. It was an older gentleman with long hair, a long beard and a Carhart hat. He helped me get the boat up on my rack and I thanked him. He hopped back in his truck and pulled up next to me before he drove off. He jerked his thumb at the canoe and said “You know – you can’t use that for a few months.” And then he drove off into the snow.